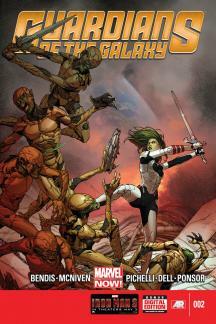 This issue of Guardians of the Galaxy features two related stories; in the present, we see the Guardians fighting off an invasion of London from the Badoon aliens. Via flashback, we also get to see a meeting of the leaders of various galactic empires as they decide that Earth is off limits for any of them. The backstory is the weaker bit; it’s too reminiscent of the boring bits from the Star Wars prequels with the galactic political process. Somebody could probably do this justice – and at least most of the alien empires are led by actual aliens who look satisfactorily alien as drawn by Steve McNiven – but a large part of this book's audience is here to watch an anthropomorphic raccoon shoot things with ridiculously oversized guns. There’s supposed to be some intrigue about the Spartax envoy’s ulterior motives; but, seriously, Rocket Raccoon isn’t shooting anyone. Boring. The London bits are what we’re here for, and they don’t disappoint. Each of the Guardians takes on a Badoon ship by themselves, and the pages are divided into six even panels, showing how each character does his or her thing, with the final panel devoted to poor Groot (who got blown up last issue, remember) showing off the Marvel universe’s slowest healing factor. Great stuff. Just like last time, the second issue of the creative team of Heather Nuhfer and Amy Mebberson is strong. Hopefully the pattern doesn’t completely repeat, though a last panel reveal proves, hey, this arc can go dark and scary too. Let’s hope it doesn’t go too far, this time. There are children reading. Maybe. The beginning features Applejack roping the moon (with a magical assist from the princesses Celestia and Luna, of course). Rarity has been taken prisoner there by the Nightmare forces; it seems Luna was only the Moon half of Nightmare Moon. 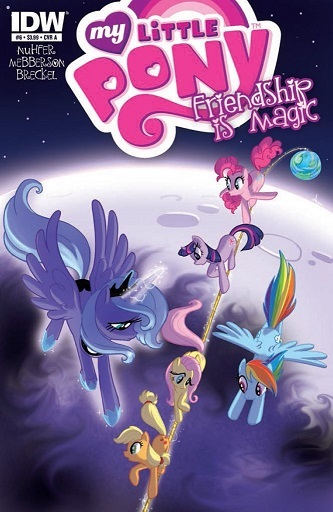 The ponies, plus Spike and Luna, travel via the enchanted rope to the moon; I don’t think this was a plan NASA ever considered, but for an all-ages fantasy comic, this is pretty neat stuff. On the moon, they face rather un-nightmarish nightmares. You’d think somebody would be scared of just, you know, spiders or something, rather than failure. The jokes keep coming, of course; some are pretty good (Fluttershy identifies some lunar fauna as “possible inherent evil”), and the rest are gone fast enough. The issue contains a specific show reference (Spike carries the gem from “Secret of My Excess”), and even a cameo by the gremlins from the Rainbow Dash issue. I didn’t mean for this to happen, but all three issues here feature themes of space exploration or alien invasion. This stand-alone story by Joshua Williamson covers Krang, the alien brain from Dimension X, and the story of how he became a truly formidable opponent … despite being, you know, an alien brain. I always preferred Krang as a character, rather than a race. He had that funny voice in the old cartoons, high-pitched and kind of whiny; he wasn’t very threatening, but he was certainly mean-spirited. A decent villain for a kid’s cartoon. In this comic book version, Krang is a much more scary opponent; first of all, he has that giant gun-toting body, but, as this issue proves, he doesn’t need it. It’s just extra bonus points. This is a world full of ninjas and otherwise highly-skilled hand to hand fighters. Taking an unarmed brain with a couple of tentacles and having him hold his ground and not have it be laughable is no mean feat. The story is a strange boy’s own adventure; Krang is a young, immature brain who stows away on a warship looking for adventure, and experiences— well, not a hero’s journey, exactly. Kind of the opposite. It does its job well, but wouldn’t work if the art didn’t do just as good a job convincing us the little pink brain is a real monster. 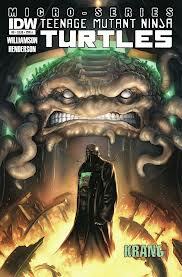 Thankfully, Mike Henderson’s art is mostly up to the challenge; he’s also smart enough to know what not to show.